EdemaWear® stockinet utilizes a new textile technology, Fuzzy Wale Elastic Compression (FWC), which appears to be superior to existing compression products in controlling swelling. Wales (fuzzy corduroy-like material) create a fuzzy nexus with the skin to deliver effective compression of the subcutaneous fat and to move water back to the heart. EdemaWear® is made from Medical Grade Lycra Spandex and Nylon. It is Latex Free. Treats inflamed skin (dermatitis) due to venous insufficiency – a condition where the veins of the lower extremity cannot return blood to the heart. Enhances wound healing in surgical and traumatic wounds of the extremities. Enhances the clearing of venous stasis pigment in chronic venous insufficiency. Hastens the reabsorption of traumatic bruises. Improves the late cosmetic appearance of skin grafts. Improves perfusion and healing of swollen ischemic extremities. Fuzzy Wale Elastic Compression (FWC) is the clinical term to explain the textile physiology. Wales go up and down the extremity. Between the wales, medical Lycra® spandex elastic yarn provides compression. There is non-compressed skin between each wale with patent lymphatic vessels. Over time, the wales impresses into the skin creating a “cornrow” furrow. In each cornrow furrow, tissue compression is high enough to be physiologically useful. EdemaWear® is easy to put on and take off. Donning and doffing traditional compression textiles can be impossible with traditional “tight” compression products. EdemaWear® is comfortable. It is cool in hot weather. The spaces between the fuzzy wales allow for perspiration to evaporate. EdemaWear® is inexpensive. Since Medicare and other insurances do not reimburse for compression products, EdemaWear is an enormous financial advantage for patients. Users report a “sense of comfort” while wearing EdemaWear®. It enhances lymphatic function leading to a decreased inflammatory sensation at the level of the skin. EdemaWear® melts away lower extremity swelling. 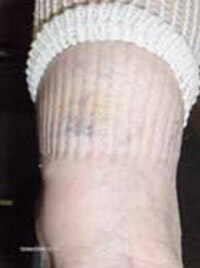 Clinical observations show that EdemaWear® treats the dermatitis of venous insufficiency. Venous stasis dermatitis is the result of deoxygenated blood that “poisons” skin. Stasis dermatitis heals because wales focus compression at the skin level. Wales deliver physiologically useful compression to the subcutaneous fat.